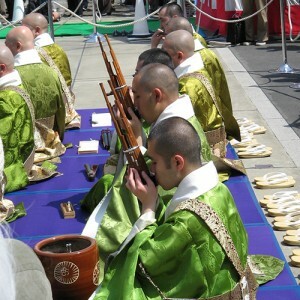 Gagaku (Japanese court music) and Buddhism share some commonalities: both were imported into Japan from the Asian continent; both have a long history in Japan; and both were parts of the lives of the nobles of the Imperial court. But the history of gagaku and Buddhism also involves interconnection and interaction between the two, something that has yet to be discussed in English scholarship. This presentation will provide a brief introduction to gagaku and the relationship between gagaku and Buddhism in different points of Japanese history. LeRon Harrison is a visiting assistant professor at the University of Oregon who researches Japanese court poetry and its appropriations of Chinese poetics. He also has been playing gagaku (Japanese court music) for 11 years and researches the history of the music in Japan and its importation and growth in America.